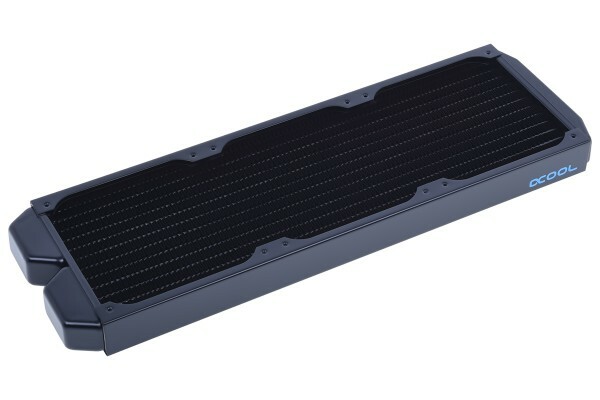 Mounting flexibility is one of the main factors on which the engineers at Alphacool focused during development. The chamber gives three different choices of fitting installation. Less angled fittings are required, again reducing flow resistance and increasing mounting flexibility. All of these features allow the radiator to be mounted even in tight enclosures where otherwise no internal installation would be possible. A ¼” de-aeration screw allows easy de-aeration of the radiator and even hassle-free vertical installation of the unit. The threaded opening can also be used for filling, e.g. in combination with a Fillport.